Antimicrobial surgical incise drapes with an iodophor impregnated adhesive, designed to provide a sterile surface all the way to the wound edge and continuous antimicrobial activity throughout the procedure. 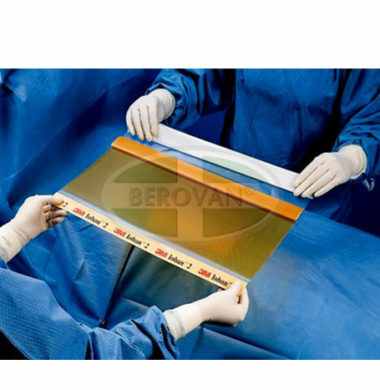 Ioban 2 incise drapes provide continuous broad-spectrum antimicrobial activity to help reduce the risk of surgical site contamination. The drape adheres securely to wound edges, providing a reliable barrier to bacteria on the skin. Incise drapes are made with a “low memory” film that conforms to body contours and stretches to allow limb manipulation. Available in a variety of sizes to meet your procedural and incision-size needs. Includes the “easy-delivery” drape application feature (except 6635).